The rest of Red Sox roster is taking shape, with the club coming to terms today with a pair of well-known players who have battled injuries and health problems in recent seasons. Shortly after the Red Sox formally announced they had agreed to terms with former Tampa Bay outfielder and Cumberland, R.I., native Rocco Baldelli on a one-year contract, the Associated Press reported that former Cy Young Award winner John Smoltz reached a preliminary agreement to join the Red Sox, ending his lengthy and remarkably successful association with the Atlanta Braves. The Baldelli signing was announced tonight before tonight’s Boston Baseball Writers’ 70th Awards Dinner at the Westin Waterfront Hotel in Boston. Baldelli will wear No. 5 for the Red Sox. 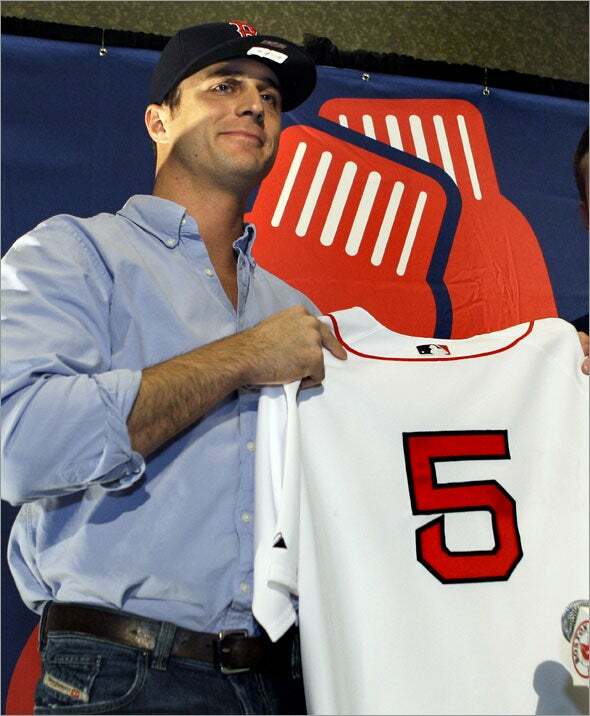 He’ll be the first player to don that number since Nomar Garciaparra. Smoltz, 41, will sign a $5 million guaranteed deal with Boston that includes the possibility of earning another $5 million in bonuses. The Smoltz deal was expected to be finalized later today according to a source familiar with the negotiations, the AP reported. Smoltz issued a statement through his agent and said he had little choice except to talk with other teams after hearing what the Braves planned to offer. The Red Sox did not announce terms of Baldelli’s contract, but a baseball source told the Globe that he will receive $500,000 guaranteed, and can earn another $1.75 million in bonuses solely for remaining on the active roster — in other words, his salary would be $2.25 million if he remains on the active roster all season. On top of that, the 27-year-old also has significant bonuses based on plate appearances that could elevate the value of the contract to as high as $7.5 million, though that number is attainable only if he makes 600 plate appearances, which is highly unlikely. Baldelli batted .263 with four home runs and 13 RBI in 28 games for the Rays in 2008. The righthanded hitter spent a majority of the year on the disabled list with a mitochondrial disorder. He was placed on the Rays’ 60-day disabled list March 28 and reinstated to the roster Aug. 10 following two rehabilitation assignments. The Red Sox have done extensive background work on Baldelli’s health. The mitochondrial disorder was re-diagnosed as channelopathy this winter, and there is hope that Baldelli, through diet and medication, can play more than previously anticipated and not suffer the same muscle fatigue to his legs that nearly ended his career a year ago. Baldelli said tonight he was hopeful as well. To make room for Baldelli on the 40-man roster, knuckleballer Charlie Zink was designated for assignment. Smoltz, the only pitcher in baseball history with 200 wins and 150 saves — he owns 210 of the former and 154 of the latter — had pitched in the majors for the Braves since 1988, though he did miss the entire 2000 season after elbow surgery. The eight-time All-Star and winner of the 1996 National League Cy Young Award was acquired by Atlanta from the Detroit Tigers for pitcher Doyle Alexander Aug. 12, 1987. After three years finishing games for the Braves, Smoltz moved back to the rotation in 2005 and didn’t miss a beat, going 14-7 with a 3.06 ERA. He went 47-26 in his second run as a starter, but shoulder pain cut short the 2008 season after only six appearances. Smoltz tried to pitch one game as a reliever, then underwent surgery to fix what he said were “five or six problems,” including his labrum, AC joint and biceps. While acknowledging that similar operations have end the careers of many others, Smoltz felt encouraged enough about his rehabilitation to begin making plans for the new season. The Braves, however, were reluctant to make a deal with the aging pitcher, especially coming off a dismal season in which they missed the playoffs for the third year in a row. His departure figures to create a major public-relations problem for a franchise that has fallen on hard times since the longest stretch of postseason appearances in baseball history. Smoltz is not expected to be able to pitch in the majors until May or June, but his acquisition gives the Red Sox their desired depth in their pitching rotation, and may make it more feasible to consider trading a young starter such as Clay Buchholz or Michael Bowden for a catcher. Baldelli has compiled a .281 average, 52 homers and 234 RBIs in 447 games over five seasons, all with Tampa Bay. He was 4 for 20 with two home runs and six RBI in his postseason debut this past fall, and delivered a pivotal hit in Game 7 of the Rays’ American League Championship Series victory over the Red Sox. For perseverance despite his health problems, Baldelli was voted the winner of this year’s Tony Conigliaro Award, presented to a major league player who has overcome adversity through the attributes of spirit, determination and courage that were trademarks of Tony C. The award will be presented tonight at the Boston Baseball Writers’ Association of America’s annual dinner. Amalie Benjamin, Tony Massarotti and Nick Cafardo of the Globe staff contributed to this report. Material from the Associated Press was also used.